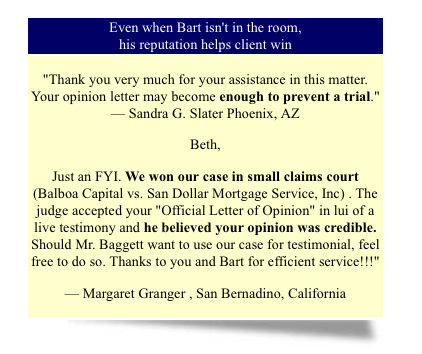 If you have a forgery or altered document problem, Bart Baggett can help. If you are thinking about hiring a forensic document examiner, there are dozens of good reasons you should consider my office to assist you. If winning your case is among those reasons, you should call us first. Cases are won or lost depending on your choice of an expert witness. Call our office today. I can provide a quick, candid strategy about your situation and consult you on your next step. In some cases I will say “Fax me the documents” for a quick review. In other cases, I might refer you to another document examiner who can better solve issues of your case (location, experience, budget, etc.) In many cases, the “truth” about a signature is all you are really looking for. I have clients of all types, and I welcome your call. I only take clients I think I can be of service, so call today for a pressure free initial consult. In every conversation, I’ll be professional, efficient, and honest. I don’t waste my time or yours. If I agree to that your case is valid, I will help you win in court and testify for you in court… and my clients usually win their case because there is a reason I’m one of American’s Top Handwriting Analysts/ Experts. 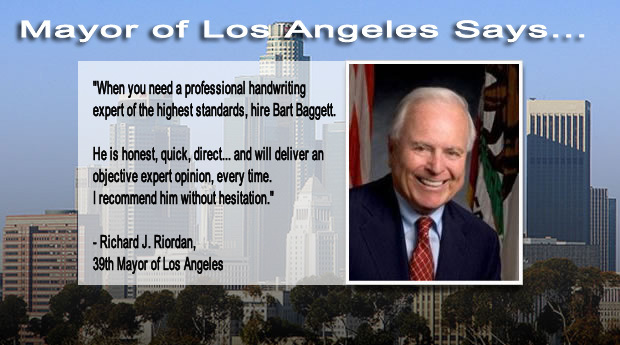 Choosing the right handwriting analysis – document examiner is as important as choosing the right attorney – it can be the critical factor in the eyes of a judge or jury. 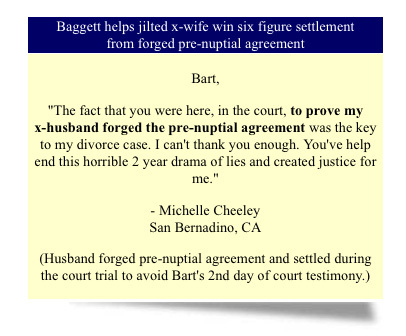 But, most of our cases never get to trial… a letter from me makes most opposing counsels want to settle. Call me first, it might make the difference. 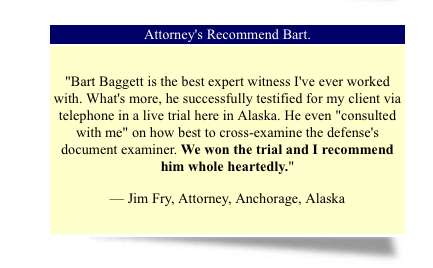 I’ve got more experience and credibility than most document examiners working today… and I’m better under cross examination that any of them! I can quickly determine if your document is a forgery using our inexpensive “verbal opinion” option. You can get started right away with a fax machine, email, and placing your order online, using any major credit card. Click on the order now button for your case to be FAST TRACKED into our case queue. Or, you can pick up the phone and talk to me first. Our fee schedule is among the lowest in the industry and our credibility, knowledge, and customer service is among the highest. In a nutshell, if you have a document where the authenticity is in question… we can help you.